Michael Vaughan and the England management will undoubtedly have made meticulous plans ahead of this highly anticipated series with South Africa, and things could not have gone much better after the opening three days of the series. Graeme Smith had inserted England and then had to watch the home side pile up 593-8 with Ian Bell and Kevin Pietersen complimenting each others styles perfectly. It was then the turn of the England bowlers to demonstrate to this highly acclaimed South African attack how to bowl in such English conditions. Job done – South Africa were rolled over for 247, only Ashwell Prince showed anything of the traditional South African fighting spirit. However, since the end of day three, it would be fair to suggest that South Africa have consistently played the much higher standard of Test cricket, dominating all six of the following days. If it was Smith’s plan to lure into England into false hope and then punish them with disciplined batting and threatening pace bowling, then it has certainly worked so far. In the opening Test South Africa struck back, losing only a solitary wicket on day four, that was Smith, but not before he had registered his 15th Test century. Along with Neil McKenzie, who also reached three figures, they batted watchfully, but ceased on the loose ball when it arrived. The tourists were determined not to undo their good work on the final day, and Hashim Amla dealt with a hostile short pitched bowling theory from England to join Smith and McKenzie with a hundred. McKenzie has transformed himself into a natural looking opening bat, despite his superstitious idiosyncrasies at the crease, he looks exceptionally well organised and skilled in allowing the ball to come to him and executing his shots late and under his eyeline. On 138 and after 447 balls, his concentration slipped as he fished at a wide one from Anderson, and when an out of sorts Jacques Kallis fell for only 13 England had made small inroads on a Lords track that was offering very little assistance. Monty Panesar will testify to this, as he went 60 wicketless overs in the second innings after picking up 4-74 in the first. Prince saw the day through with Amla helping South Africa to 393-3 in the second innings. A typically gritty comeback from Mickey Arthur’s men, showing the necessary battling qualities required when your side have their backs to the wall. In the second Test they displayed the ability to strike when the opportunity arises and not let your opponents off the hook, which paid testament to the qualities and the awareness they have in their side. England lacked penetration at Lords, they did not bowl badly, but were missing something special, be it an out and out paceman or the elusive mystery wrist spinner. Vaughan was pro-active in his field placings, but simply could not force a way in. The batting looked in decent order, Pietersen predictably flayed South Africa to all parts. He would have felt under severe personal pressure to do well and he coped admirably once he shakily got off the mark to a risky ‘Red Bull’ single. Ian Bell was another player that may have felt the harsh eyes of the media questioning his worth in the side, he replied in the best possible way, indeed he was elegance personified. It was only unfortunate that he failed to make his double hundred when Paul Harris snatched an impressive caught and bowled with the stylist on 199. England’s selection policy made the headlines before the start of both Test matches. At Lords they announced the same starting line-up for a world record sixth time, then at Headingley Paul Collingwood lost his place to the returning Andrew Flintoff, yet certainly more surprising was the inclusion of Nottinghamshire pace bowler Darren Pattinson, after Ryan Sidebottom had failed to recover sufficiently from his back problem. Pattinson had been picked seemingly from nowhere, his selection coming in spite of having only 11 first class matches to his name. Chris Tremlett will have been understandably disappointed after he was overlooked despite being selected in the squad before Pattinson. Vaughan suggested England wanted a bowler that will pitch it up and swing the ball. Matthew Hoggard is surely getting the hint that it will only be in extreme circumstances that he will regain his Test place. Smith once again inserted England and boy did it reap dividends. The misfiring attack that featured at Lords had a point to prove (barring Morne Morkel who was the most impressive on show), and it took only 52.3 overs for the whole England side to be back in the shed. Four more wickets for Morkel and four for Dale Steyn had put South Africa in prime position, yet England worked hard to recover, and at 143-4 South Africa were in danger of wasting the initiative. Enter Ashwell Prince and AB De Villiers who gave England a lesson in shot selection on a Headingley track that was very different to the one they played on at Lords. Yet why was it that the visitors made the adjustment much better than the home side ? Prince and De Villiers were selective where as England wasted good starts with airy fairy strokes outside the off stump. Prince is renowned for grinding out his runs, despite his top score being 38 in his previous eight knocks before this tour. De Villiers on the other hand was best known for his flashy 30’s, not being able to resist temptation and constantly throwing his wicket away. Was his 217 not out in Ahmedabad against India in April an exception rather than rule, further evidence at Headingley suggested the boy is becoming a man and he appears willing to accept the responsibility that comes with it. He still played his extravagant drives and severe cuts, but he was more selective and put much more value on his wicket than any of his English counterparts. There was no shortage of controversy in the shape of two suspect catches. Firstly De Villiers himself claimed a catch in slip that clearly showed on the replays it had gone down, and Andrew Strauss was right to stand his ground. 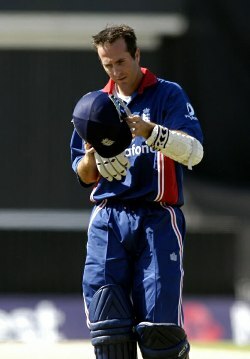 Later in the game it was Michael Vaughan’s turn. Amla got a leading edge off Flintoff and Vaughan threw himself forward at mid-off in a rare show of athleticism from him in the field. He threw the ball in the air and received the congratulations of his team-mates only for the South African players and Mickey Arthur to wave him back on the pitch and await a decision via the third umpire. The replays were not clear enough to prove the catch was taken and Amla returned to the crease. It would have meant South Africa were reduced to 76-4, with the game in the balance. South Africa were eventually all out for 522, Prince making 149 and De Villiers 174. England may be in severe trouble should Kallis start finding the middle of his bat. England had over two days to bat out and a deficit of 319 to negotiate. Was there anyone willing to repeat Michael Atherton’s rearguard action that earned England a draw in Johannesburg back in 1995. The answer was no, despite everyone but Andrew Strauss and Ian Bell making double figures. Not knowing whether to stick or twist, England could not stop losing wickets. The South Africans kept the pressure on and never allowed a potentially damaging partnership to develop. The experiment of batting Tim Ambrose at six may be short lived, without being in a particularly good run of form he was promoted in the order to allow Flintoff to come in at seven. Stuart Broad is developing very nicely with the bat, and showed what was possible with a positive mindset. He was left stranded on 67, following on from his 76 in the first Test. England have so far been outbowled and outbatted in the series. They have lacked penetration with the ball and with the likes of Steve Harmison, Simon Jones, Sajid Mahmood and Matthew Hoggard all pushing hard for a recall with good domestic performances, Darren Pattinson may wonder if his Test cap will cut a lonely feature on his mantelpiece. England will hope Ryan Sidebottom will also be in contention for the third Test at Edgbaston. It is not a time for drastic change for England, they recovered from going 1-0 down in New Zealand earlier this year, but it is unlikely South Africa will be quite as willing to have the initiative wrestled from them. Equipment Review – Canterbury steps things up!